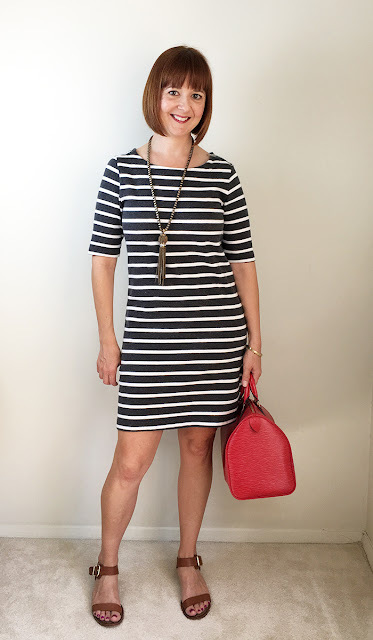 This is a Gap dress from a few years back and I like that it's a grey and white stripe which seems less common, somehow? Gap is all weird rompers right now but Old Navy has a grey and white shift dress that looks pretty cute. 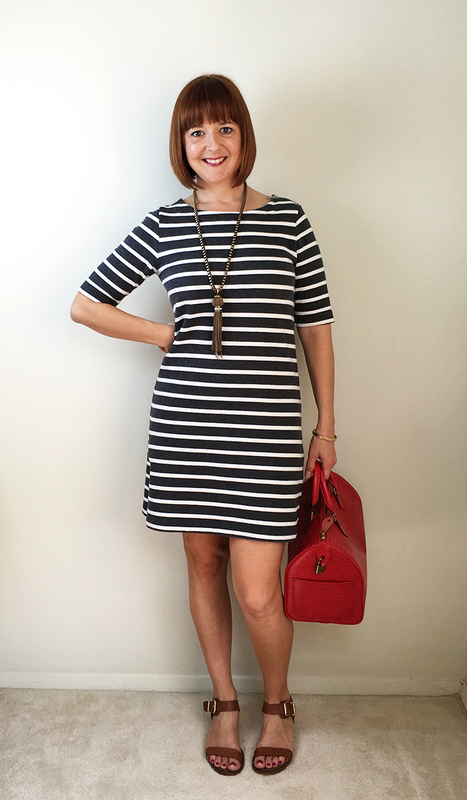 I also like the flattering graphic striped design on this Joe Fresh dress and the pure potato sack comfort (really!) of this cute Max Studio dress. 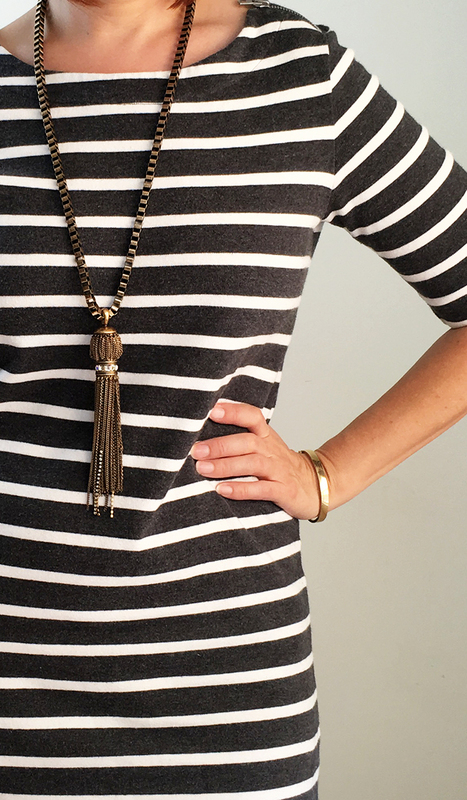 My giant tassel necklace is an old one from Ann Taylor but tassels are a thing right now. This one at LOFT is my current favorite and this beautiful Lulu Frost tassel is basically my dream. And oooh, check out this one at J.Crew! That's the stuff. 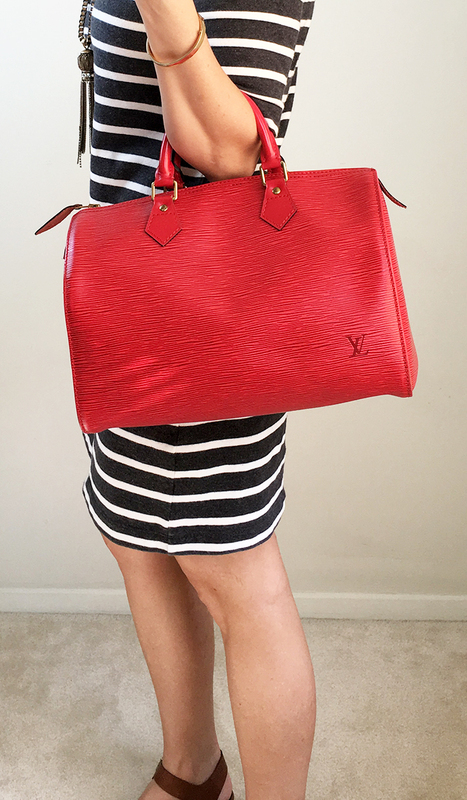 I've talked about my bag many times - a "vintage" LV Epi Speedy that I adore despite it not being entirely practical. 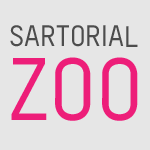 There's just something really satisfying about a bright red satchel. This Cole Haan satchel gets the color exactly right and I love the dome shape of this red satchel at TJ Maxx. This bright red ZAC Zac Posen saffiano tote is basically my dream. Ugh, I love it. For my bargain pick, this sharp Gabriella Rocha bag looks way more expensive than it is. My sandals are Sam Edelman "Trina" in whiskey and they are so good, you guys. Comfortable and cute and I love the metallic heel. They come in a few different colors and I'm seriously considering another pair. Yoox has a similar style in beige and black (also Sam Edelman) marked down to $49, but sizing is limited. Also, the Trina is better. Just saying.